Team World Vision performed street play in the various slum areas of Bhopal on Saturday. Spreading awareness about family planning. With the message of “bache do hi ache”. Day-by-day people are getting influenced with the cultural activities and using them as a medium of spreading awareness. With the increasing rate of literacy, theatres, street plays and various arts are being used in enlightening a common man’s mind. More than hundreds of NGO’s are working in this field with a great enthusiasm. The fact which matters is people are accepting the messages and implementing them in their daily routines. 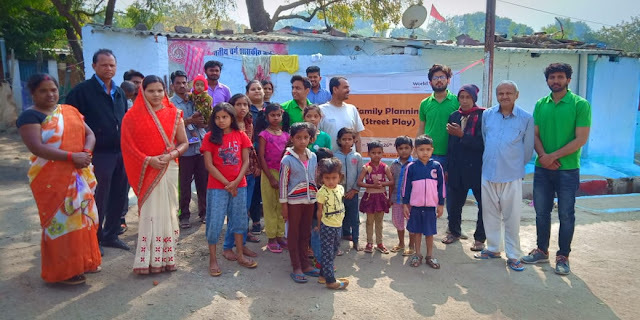 Street play “family planning” conveys the message that a family should think before giving a new life, medications should be used to avoid unwanted pregnancies, proper budgeting should be done for a good lifestyle. They even told the disadvantages of increasing population in India which includes unemployment, lack of necessary resources and increasing pollution as well. Kids enjoyed watching the play, youngsters and elders appreciated the play by conversing more about the topic from the team. Artists even got clicked with the audience. The act was successful in spreading the message.